Blast off into a new galaxy with the Big Bang Slot Machine. The payouts seem almost infinite with the game’s Multiplier Meter that keeps getting higher with each consecutive win. Even the standard reel symbols can award up to 1,000 coins at once. Not only that, but the colorful and cosmic animations create an exciting atmosphere while playing. 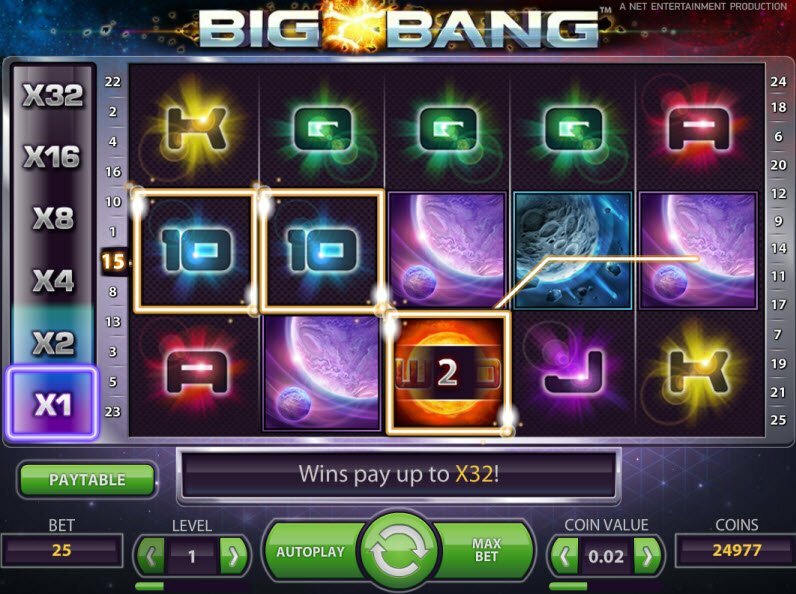 Take a trip through space with the Big Bang Slot. Togeher the bonuses and graphics create a supernova of entertainment. This lucrative slot by NetEnt software contains a special Multiplier Meter feature. After each consecutive win, the multiplier doubles up to X32. This could lead to payouts of astronomical proportions! 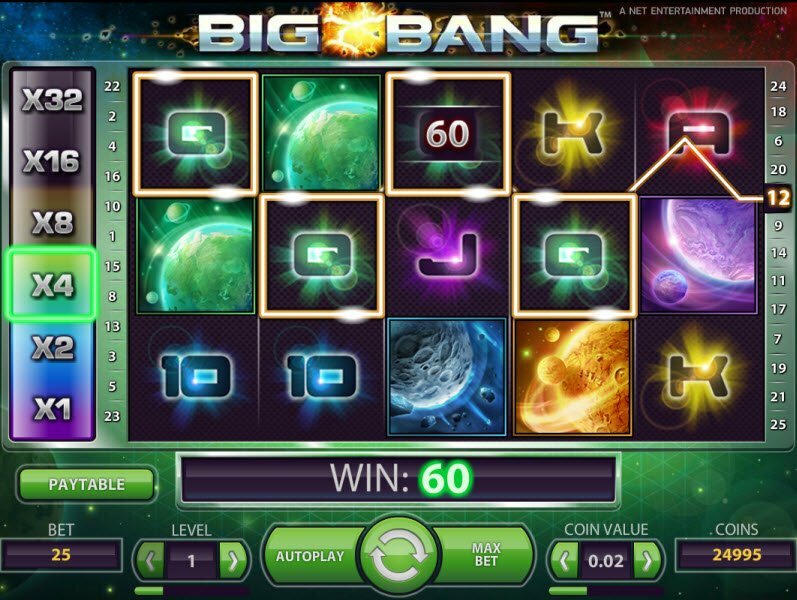 Net Entertainment software released the Big Bang Slot at just the right time. The movie Gravity came out in 2013 and fascinated movie goers with its 3D special effects in outer space. The Big Bang Slot is the casino world’s answer to Gravity. The reels contain fascinating images of glowing planets and burning asteroids. The game animates in excellent quality, making this the perfect portrayal of a cosmic journey through space. It goes without saying that this game has a great atmosphere as well (ooh snap!). After each winning combination, the meter goes up to double the multiplier: X2, X4, X8, X16, and X32. The meter goes all the way up to X32 with each sequential win. I want to let you in on a little secret among us casino players. When it comes to online slot machines, multipliers are arguably the best bonus feature. 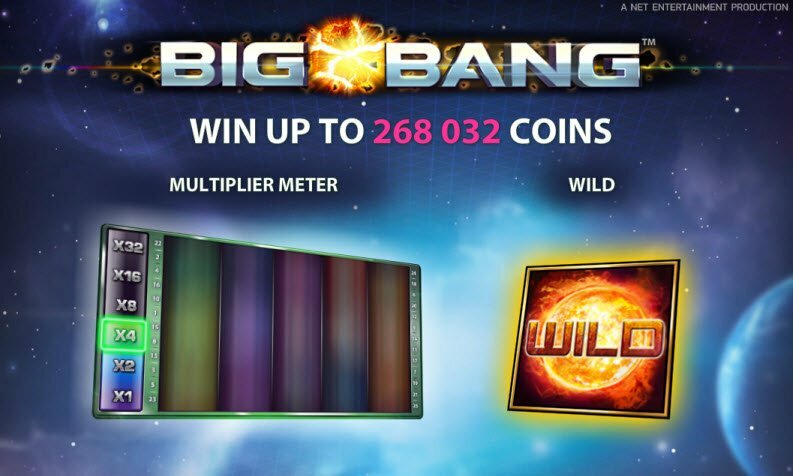 So the game developers at NetEnt got it right when they made the Big Bang Slot Bonuses all about the multipliers. In the game, they call this special feature a “Multiplier Meter”. Basically, after each winning combination, the meter goes up to double the multiplier: X2, X4, X8, X16, and X32. The meter goes all the way up to X32 with each sequential win. For those who don’t know, this means that the payout will multiply by that number. On top of this, the Big Bang Slot has a Wild symbol which substitutes for all symbols. Although the game doesn’t contain a Scatter, each “ordinary” symbol can actually award quite a large amount. For instance, 5 of the red glowing planet pay 1000 at once! Imagine that paired with a X32 Multiplier!